Next planet is Mars. Why is there a "(Z)"? 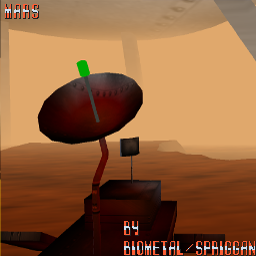 Well, there's already a "Mars" uploaded here, so I had to alter the name someway. The track is under 1,000m *gasp*, but I expect Last_Cuban will still say that it's too long or not long enough. Check the Readme for things. If you find broken things, say so here (no one does anyway. Don't be afraid of me). Since there are multiple stars in Practice Mode, you will need to find one and not restart/re-enter the track, otherwise the rest of the stars will disappear. They won't disappear once you've found one and stay in the track. If you do exit, you'll have to go into the "profiles" folder where your game is installed and erase the level data file for the track. Doing that will reset your progress of the track and put the stars back.